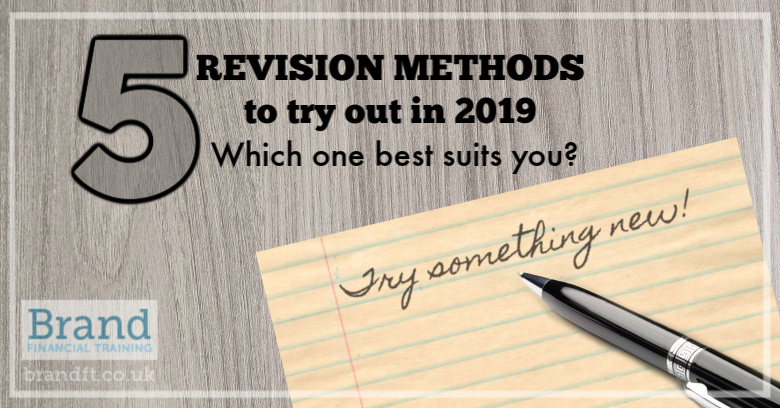 Brand Financial Training > Studying and Revision > 5 Revision Methods to try out in 2019 – which one best suits you? With 2019 well underway and with the festivities a rapidly fading memory, your thoughts have no doubt turned back to your studies. Now is the perfect moment to consider study methods and find out which ones best suit you. We’re going to take a look at a selection of the different techniques that are available to help you commit information to memory. Why not make it your belated New Year’s resolution (assuming you’ve already given up on the original ones!) to try one or two of these? This involves repeating information out loud or maybe writing it down, to help memorise it, rather than just sitting reading textbooks passively. The thinking goes that just reading (or, in some cases, doing little more than staring at a page) can engender a false sense of security, since students believe they know the topic because the information is in front of them. Many of the specific methods below rely on aspects of this, but you can use this concept more generally, too. SURVEY or skim a chapter before reading it, taking in the title, headings, first and last paragraphs and summary. The title and headings etc. can be turned into QUESTIONS, which you ask yourself at the end of each section. When you come to READ, do so actively, and answer the questions previously raised. RECITE the information as though you were telling someone else about it, in your own words. REVIEW and make sure you understand the content of what you have read, again in your own words. The American physicist Richard Feynman is remembered for his ability to explain complicated concepts clearly. This is his technique. Write the name of a topic at the top of a sheet of paper or in an empty notebook. Then explain the topic in your own words in plain English. Don’t just give definitions – work through some examples as well. Next, review and identify the areas where your knowledge or explanation could be improved. Then go back to notes or source material to find the missing information. Named after German scientist Sebastian Leitner, this flashcard-based method forces learning through repetition of the material you know least well. Have questions on cards, in piles or boxes, and move those with questions you answered correctly further down your row of boxes (or piles), while shifting cards which you’ve answered wrongly back to the first box (or pile). This way the cards in the first box are studied more often and you have to review the information until you know it. The intervals between the questions you know the answers to become greater as you work your way down the line. This is a great way of assessing how you are doing with your revision, and of identifying areas for improvement. You’ll also get used to the ways papers are structured and worded for each subject area, so there are no unpleasant surprises on the day. Consult the mark schemes (if available) to learn where marks are allocated, and how much choice is offered, and start to appreciate how much time to spend on each section of the exam. You may also be able to download examiners’ reports on previous exams and find out where mistakes are most commonly made. Used as part of your revision process, past papers cement your knowledge and take the fear out of looming exams. These are just a few of the many different techniques available to help you absorb information in a way that it ‘sticks’ for more than a few hours. In the weeks and months leading up to your exams, pick two or three revision processes that you’ve not tried before to see which ones work best for you.